The festival of colors Holi is knocking at our doorstep signaling us to come out and get coloured by our family and friends. This marks the beginning of the spring and time for fun and frolic. 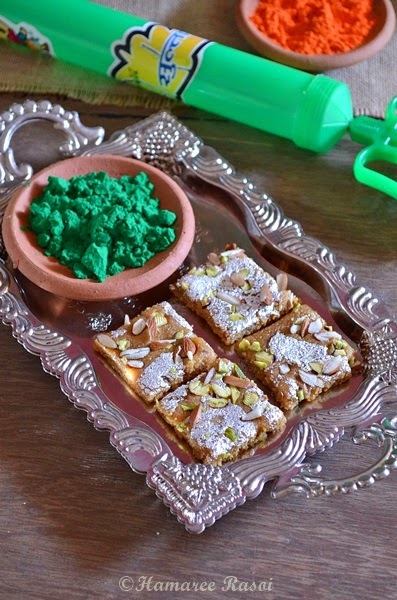 So to energize ourselves to apply colours to others and also to save ourselves from getting caught and drenched with coloured water, presenting these khoya based sweets. Hope you like them and they form a part of the Holi festival at this year. 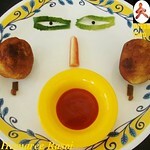 They are very easy to make and takes less than 10-12 minutes to make ! We have purchased herbal colors /gulal and pichkari for Holi. What's your plan? Heat ghee into a heavy pan on low flame. 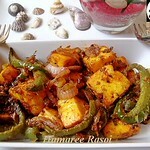 Put mawa into the pan and roast it on low flame till it melts (it takes 2-3 minutes). 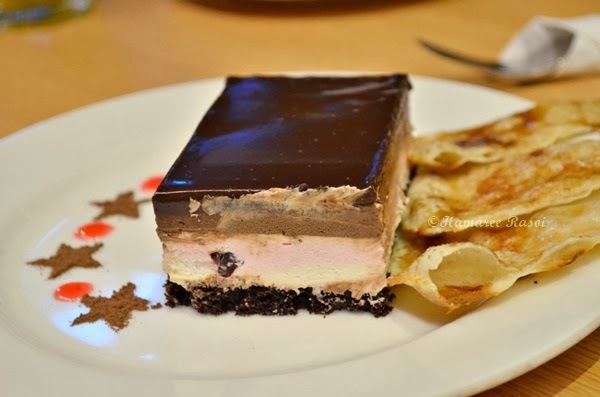 Remember if you want very smooth burfi you should add sugar, flour immediately or else let it turn pink in color for little grainy texture like I did. Add sugar and flour into the pan and stir continuously. After 2 minutes add milk and mix thoroughly. 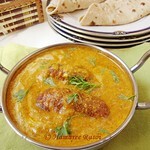 Sprinkle cardamom powder and cook till it thickens. Pour the mixture in the greased tray and spread it evenly into it. Or you can spread the mixture on a greased butter paper and roll gently to spread it. 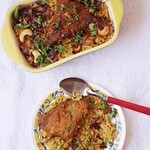 Garnish the mixture with chopped almonds and pistachios. 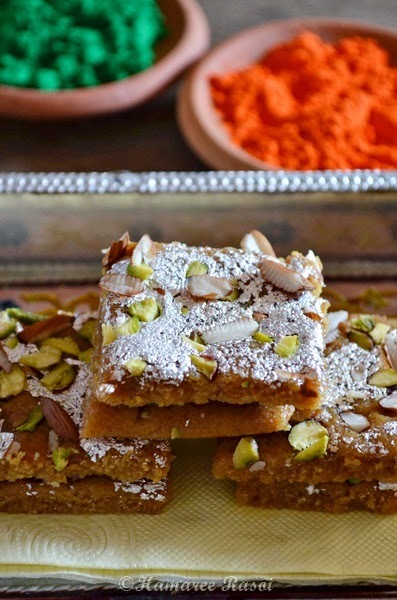 Immediately decorate the top with silver varakh and spread chopped nuts over it and gently press it with a rolling pin, that way the nuts will stick on top. Let the burfis set on their own and once cool completely cut in desired shapes. 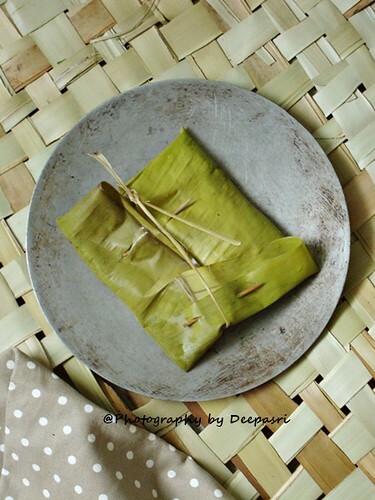 Your homemade Mawa Burfis are ready ! You can keep these delicious burfis outside for 2-3 days not more than that or else keep in an air tight container in refrigerator. 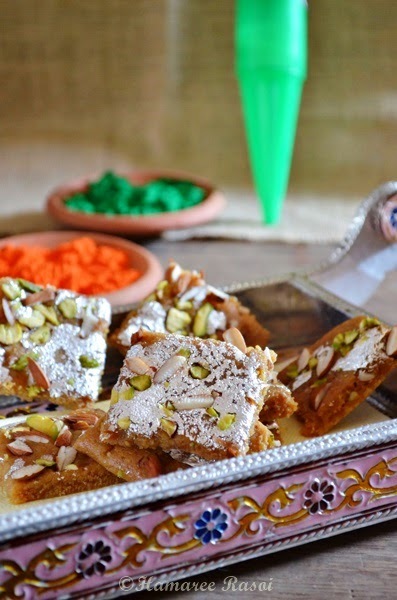 If you want light almost whitish color of burfi don't fry till mawa turns pink. 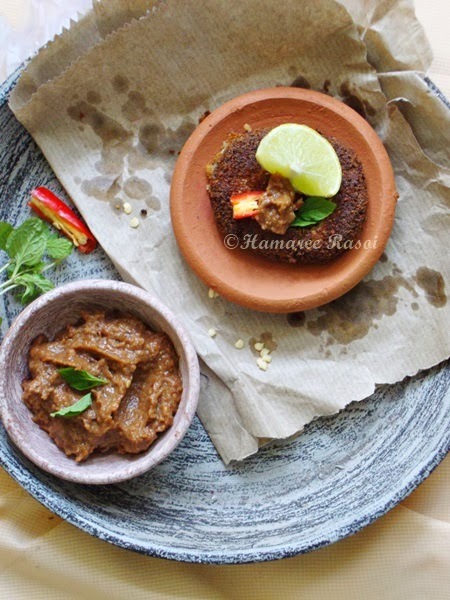 Cook sugar and mawa together so that it combines well otherwise if you add sugar later it will not mix thoroughly. Using silver varakh is optional. I wanted to control my intake of sweets during this festival season so made them little thin :-P you can made them thick like sweet shops. 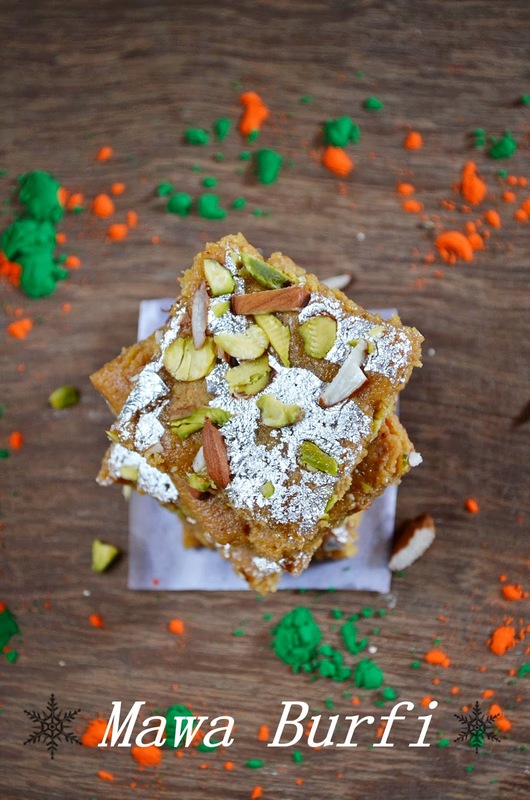 read more.. "Mawa Burfi | Khoya Barfi| Easy Holi Sweet"
I will straight come to today's recipe as I need to study :-P Yes preparing your kid for final exams is not an easy job ! 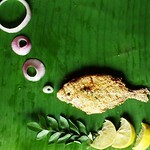 I had learnt this recipe at a food demo, probably Aditya Bal's NDTV good food. 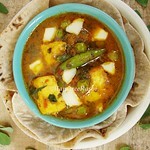 Take hung curd, paneer and potato in a large mixing bowl and mix everything very well. Heat 2 tsp oil on low flame and add cumin seeds first. Once cumin seeds crackling add grated ginger and green chilies. Fry for a minute and immediately turn off the flame. 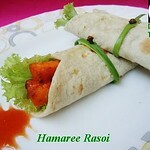 Add this to the paneer-yogurt mixture and mix thoroughly. Add salt, garam masala, pepper powder and mix well. Kebab mixture is ready. Now divide the dough into 12 equal parts by making small round balls. Using your palms slightly flatten a round ball and put one cashew in the center and roll again to make a smooth ball. Grease your hands with oil if working with sticky dough is bothering you too much. Take cornflour in a plate and coat this ball evenly. Like wise make all kebabs. 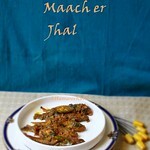 Now here you can fry them as it is in hot oil or you can double coat it for crunchier texture like I did. 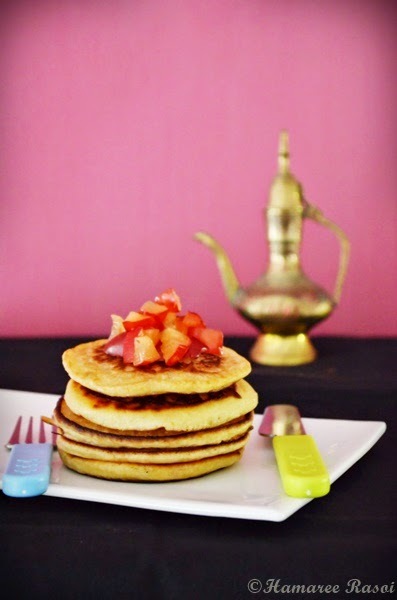 Mix a little cornflour with cold water to make a smooth white batter for coating. Dip the balls in cornflour liquid batter and sprinkle some breadcrumbs over them. Heat oil in a non stick pan and fry the patties from both sides, till golden brown. 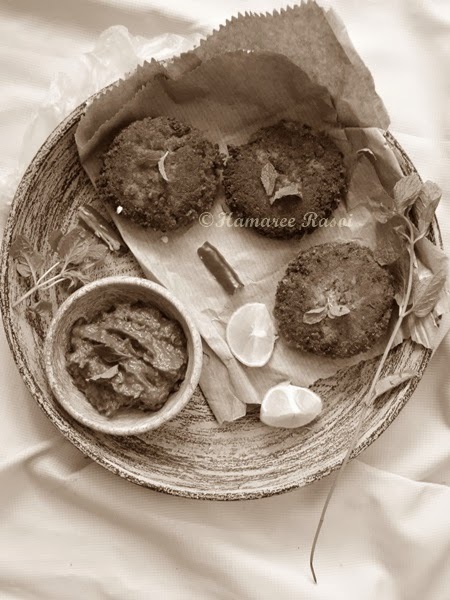 Place the patties on an absorbent paper and serve them with chutney of your choice. 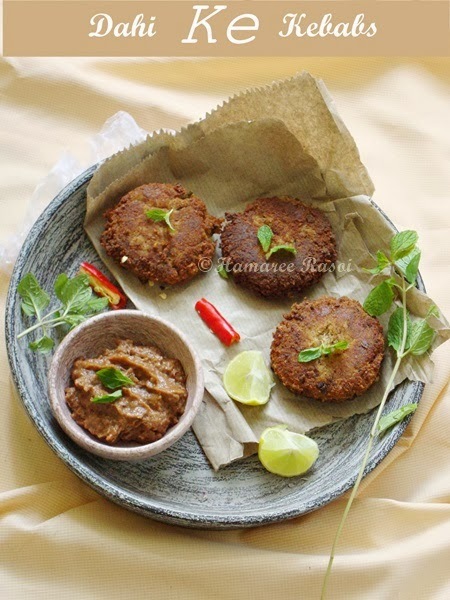 I generally serve these patties with Coriander chutney or Onion chutney. 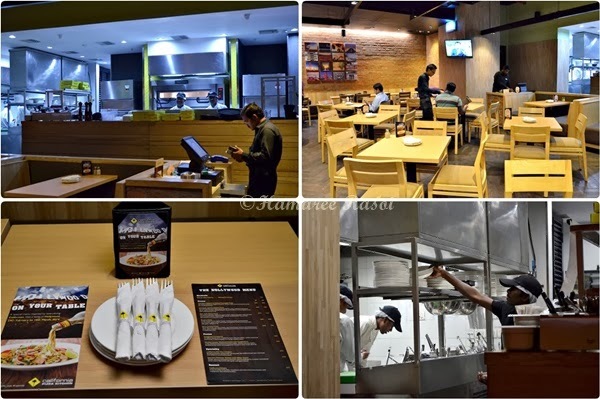 read more.. "Dahi Ke Kebabs / Yogurt Patties "
It's been an year in Chennai and I am amazed to see inauguration of many Global Chains of Restaurants and Malls for us to explore and this CPK is a latest extension to it. So whenever possible and time permits I recommend that we should try out such gourmet restaurants just once and then place our opinions. Well, it's been a first time when that I have reviewed the same restaurant mainly for two reasons. 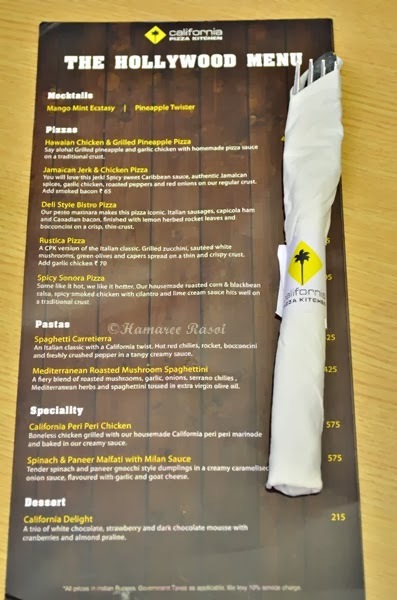 Firstly I had liked their innovative style of pizza and other dishes in my last visit and secondly they have introduced a new range of menu called as "Hollywood Menu". "Why they have named it Hollywood Menu" well upon asking they just said these dishes features Hollywood's most wanted dishes. Moreover I needed a break for myself as my son's exams season is making me home arrested. 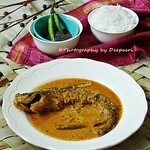 So one fine evening we went to taste new dishes on the menu but only for a short time. This special Hollywood menu was introduced on 24 Feb 2014 and will continue till 16 March 2014. 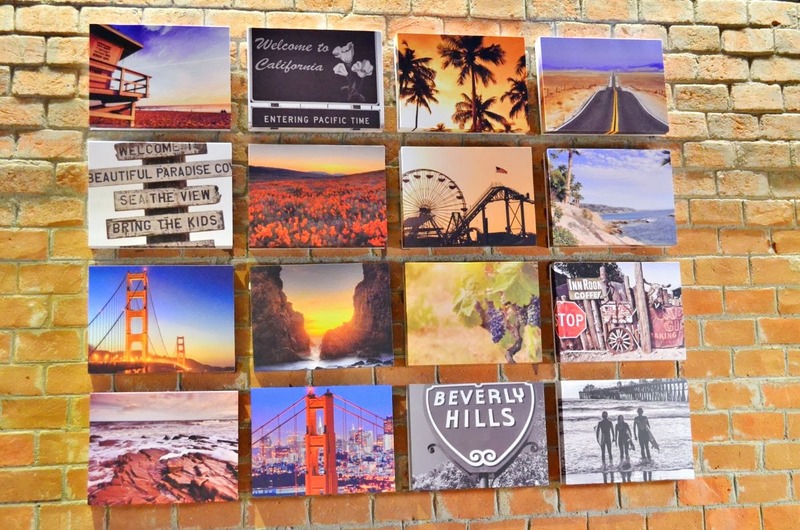 The range mainly consists of five special pizzas, two special pastas, Peri Peri Chicken and a dessert called as California Delight. I will post about the dishes I had tasted. Since CKP is yet to get liquor permit they have two Mocktails to offer Mango Mint Ecstasy : A combination of mango pulp, mint leaves, sweet and an orange slice. It was on a sweeter note. Sipped Pineapple Twister which my friend Pari had ordered. I liked it more as it was well balanced with pineapple juice, lemon chunks and floating mint for flavours. Both are priced Rs 195 each. 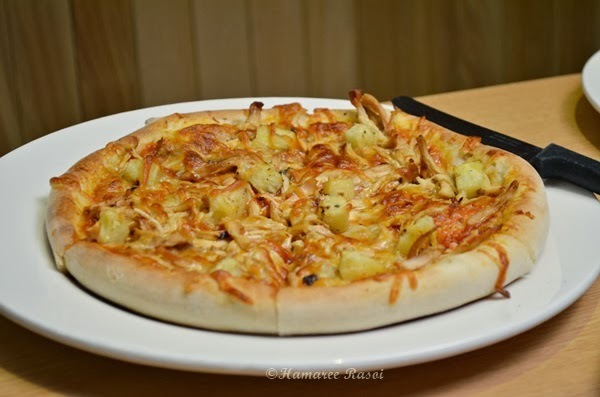 Grilled Pineapple and Garlic chicken with their own pizza sauce on a tradition crust was ok. The pizza base was chewy. Sweet and spicy Caribbean sauce with grilled chicken, roasted peppers on a traditional crust were going well but again the dough I believe wasn't fresh. This is CKP's perhaps best pizza ! 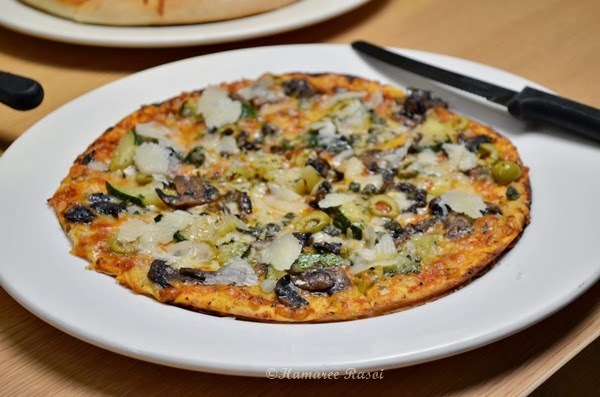 Yes their take on Italian classic that has grilled zucchini, green olives, mushrooms spread on a thin and crispy crust. 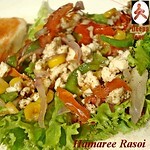 Non vegetarians can add garlic chicken with an addition of Rs.70 only. Don't miss this one !! This truly is your destination if you are a ham & bacon lover. 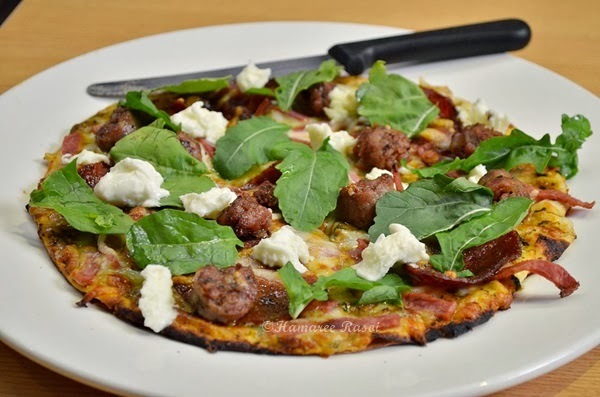 Italian sausages, ham and Canadian bacon with loads of rocket leaves and bocconcini on a crisp thin pizza !! 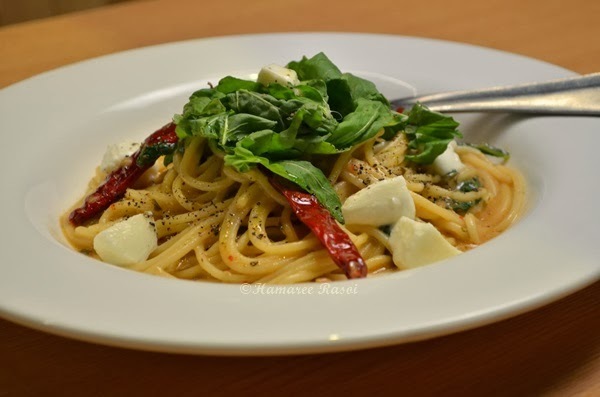 The tangy creamy sauce caught my attention the hot red chilies, bocconcini and some pepper powder couldn't save this pasta as the half cooked pasta isn't going to do any good to your digestion. Mediterranean Roasted Mushroom Spaghettini has roasted mushrooms, garlic, onions, serrano chilies along with Mediterranean herbs in it but it was a tad too dry for me. Perhaps a bit of olive oil and salt could have done wonders. I loved everything about this ! 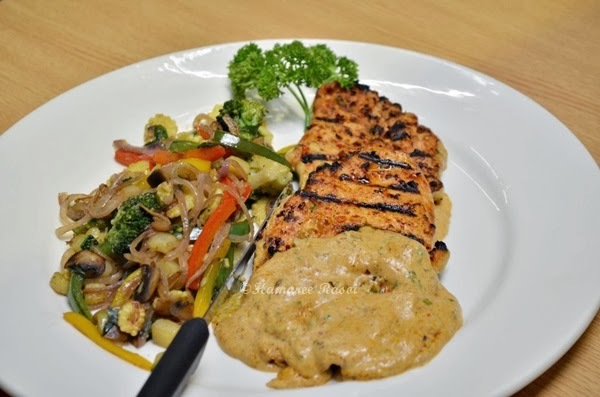 A boneless grilled chicken with their special peri peri marinade and baked in a creamy sauce is served with sauteed vegetables. 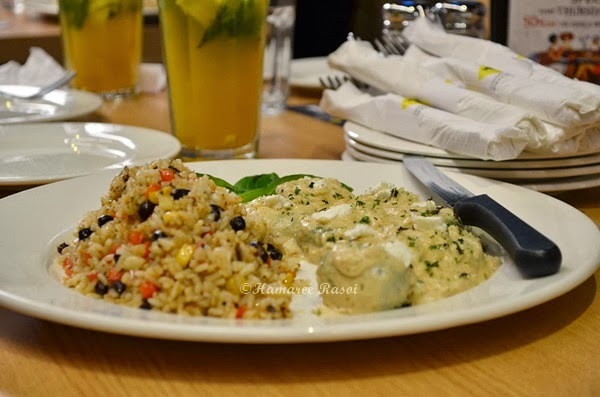 If you are coming alone then order this peri peri chicken blindly, you won't regret it ! My vegetarian friends were ga ga over it ! 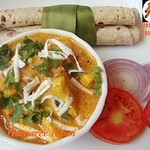 Tender spinach & paneer gnoccchi style dumplings in a creamy caramelized sauce that has goat cheese in it. 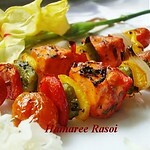 The overall experience was good, perhaps they could do more justice to the theme 'Hollywood Menu'. Disclaimer: This review is solely based on my personal experience and opinion. 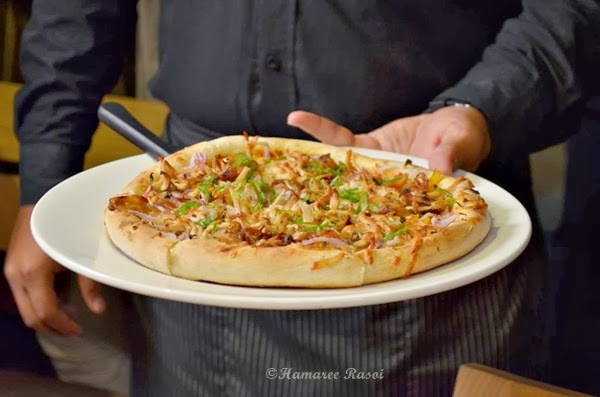 read more.. "The Hollywood Menu @ California Pizza Kitchen, India"
As I had mentioned earlier this year I would be posting many basic recipes for bachelors and many simple but important things that are part in our day to day meal. 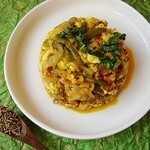 For an example though I make homemade ghee often but never posted one ! Breads, tomato ketchup, soups and juices are to name a few. 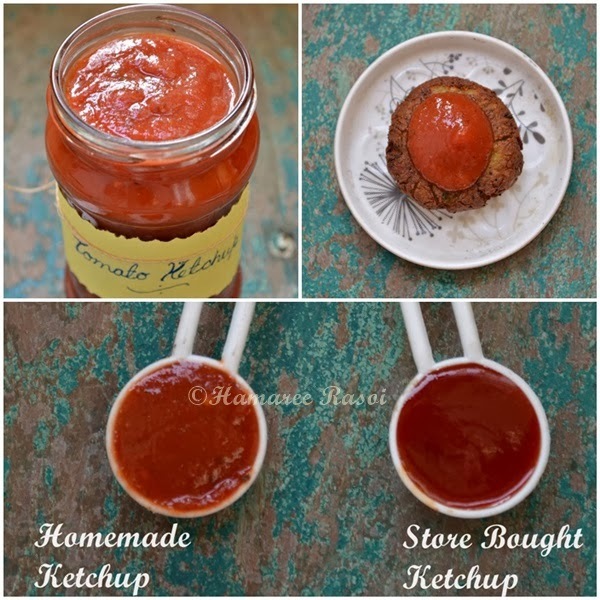 One of such item is a non-assuming homemade tomato ketchup. Keep this in fridge. We have it with every kind of snack but the ones that we buy are added with artificial preservatives and sugar. Considering the fact that there are so many ways of healthy food habits , I have prepared this homemade sauce with only natural ingredients. More over it could be stored days together. 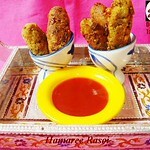 When my little one tried this one out with samosas he commented that “Mama, this one tastes even better”. That made my day and I sure hope that after making this sauce you to get compliments from all over. Tomatoes are now a days Rs. 7-8 so make good use of it guys ! I just can't emphasis enough for clean sterilized bottle to store your homemade ketchup. So do it a day ahead by washing the jars under tap and then place a big vessel with water. Boil the jars and the caps for next 10 minutes and turn off the heat. Wipe the rim of the jar with clean cloth. Then put the jars upside down and after 15 minutes turn it other way to let it dry naturally. Wash tomatoes properly and chop off the stems. Chop them roughly into four pieces. Fill a large pot of water and boil the tomatoes with crushed ginger, garlic pods, green chillies, bay leaves,cinnamon, pepper balls, brown sugar and 1 tbsp salt. Don't worry about the tomato skins as at the end we are going to remove any seeds or skins. On a medium flame stir occasionally. Slice tomatoes naturally oozes lots of water from them so no need to add additional water. Cook for about 1/2 hour or until the tomatoes are soft. Turn off the heat and let this come to room temperature as putting hot liquid inside a grinder may lead to severe accidents !! 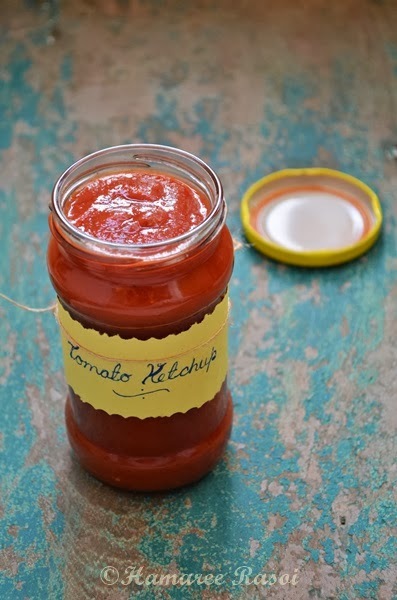 Transfer the tomato mixture in a blender and make a smooth paste. Do it in batches if your jar is small or else it will spill over ! 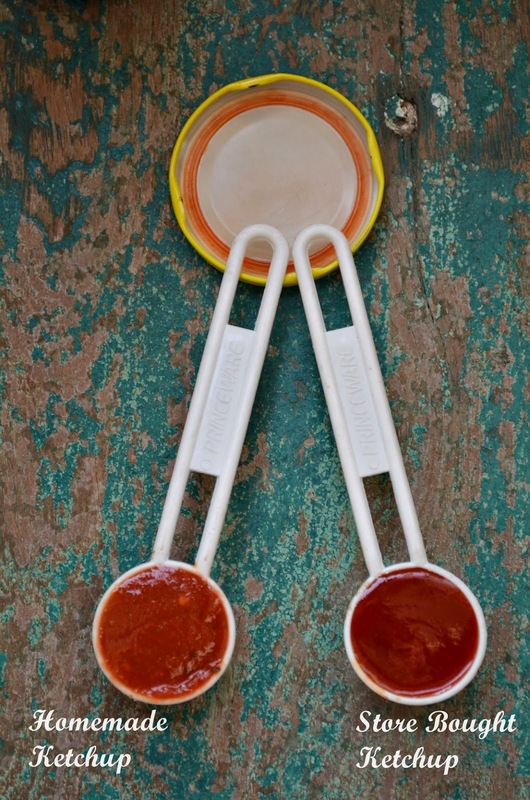 Pass the tomato liquid through a strainer. Run a fork in between for the smooth flow. Discard the skins, seeds and bring the liquid back to the burner on low flame. Add the sugar, remaining 1 tbsp dry oregano, vinegar, basil leaves and check the seasoning. If needed add more sugar (I generally make it little spicy ). After 15-20 minutes the tomato mixture will thicken. Do not add cold food to hot jars/ bottles or hot food to cold jars !! Jar will shatter. Stir frequently to prevent sticking from bottom. Be very sure that the lid of the jar and the underside of the ring is clean and fits tight. 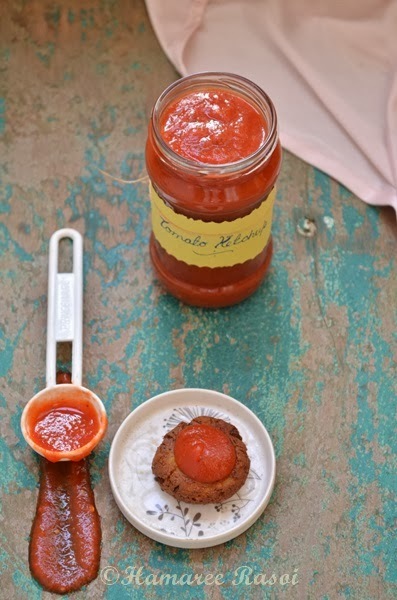 Let the tomato ketchup cool completely then store it. 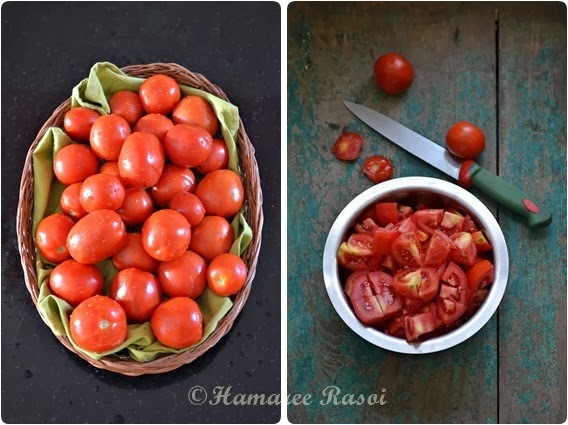 read more.. "How To Make Tomato Ketchup From Fresh Tomatoes | Homemade Tomato Ketchup"